This article is about South Korea's flag carrier airline. For North Korea's flag carrier airline, see Air Koryo. Korean Air Lines Co., Ltd. (Hangul : 대한항공; RR : Daehan Hanggong), operating as Korean Air, is the largest airline and flag carrier of South Korea based on fleet size, international destinations and international flights. The airline's global headquarters are located in Seoul, South Korea. Korean Air was founded as Korean National Airlines in 1946. After several years of service and expansion, the airline was fully privatized in 1969. Korean Air's international passenger division and related subsidiary cargo division together serve 127 cities in 44 countries, while its domestic division serves 12 destinations. It is among the top 20 airlines in the world in terms of passengers carried and is also the top-ranked international cargo airline. Incheon International Airport serves as Korean Air's international hub. Korean Air also maintains a satellite headquarters campus at Incheon. The majority of Korean Air's pilots, ground staff, and flight attendants are based in Seoul. Incheon International Airport (IIA) is the largest airport in South Korea, the primary airport serving the Seoul Capital Area, and one of the largest and busiest airports in the world. Since 2005, it has been rated the best airport worldwide by Airports Council International every year. It is also rated as the world's cleanest airport and the world's best international transit airport by Skytrax. Jin Air Co. Ltd is a South Korean low-cost airline. As of April 2018 it operates flights to six domestic cities and 26 international destinations. It launched its first long haul route, between Incheon and Honolulu, in December 2015. It has operated cargo services since November 2013. SkyTeam is an airline alliance. Founded in June 2000, SkyTeam was the last of the three major airline alliances to be formed, the first two being Star Alliance and Oneworld. As of January 2019, SkyTeam consists of 19 carriers from five continents and operates with the slogan "Caring more about you". It also operates a cargo alliance named SkyTeam Cargo, which partners ten carriers, all of them SkyTeam members. Its centralised management team, SkyTeam Central, is based at the World Trade Center Schiphol Airport on the grounds of Amsterdam Airport Schiphol in Haarlemmermeer, Netherlands. 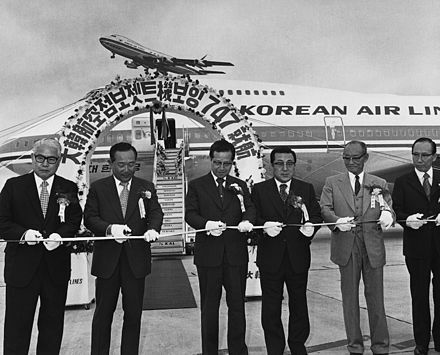 KAL introduction of the Boeing 747 for its international Pacific routes in 1973. 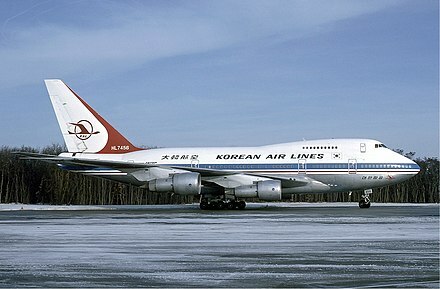 Korean National Airlines (KNA) was the first air carrier in Korea. Established in 1946 and incorporated in 1948 in South Korea, and its first official passenger flight was from Seoul to Pusan on October 30, 1948. The carrier was an international carrier – though it was privately owned by its Founding Chairman, Captain Shin Yong-Wook (신용욱). It operated under the brand name Koreanair. 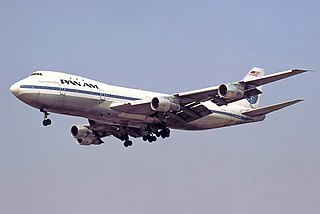 International flights to Hong Kong, Taiwan and Los Angeles were flown with Boeing 707s until the introduction of the Boeing 747 in 1973. In 1973, the airline introduced Boeing 747s on its Pacific routes and started a European service to Paris, France using the 707 and then McDonnell Douglas DC-10. In 1975, the airline became one of the earliest Asian airlines to operate Airbus aircraft with the purchase of three Airbus A300s, which were put into immediate service on Asian routes. 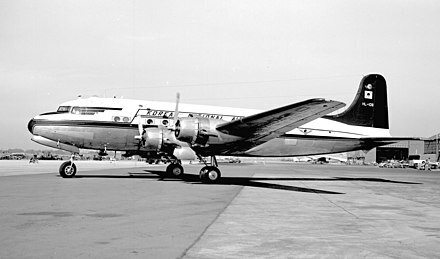 Since South Korean aircraft were prohibited from flying in the airspace of North Korea and the Soviet Union at the time, the European routes had to be designed eastbound from South Korea, such as Gimpo-Anchorage-Paris. 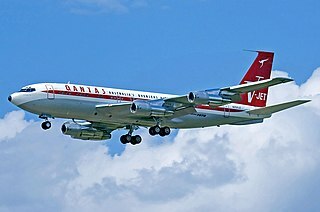 The Boeing 707 is an American mid-sized, long-range, narrow-body, four-engine jet airliner built by Boeing Commercial Airplanes from 1958 to 1979. Versions of the aircraft have a capacity from 140 to 219 passengers and a range of 2,500 to 5,750 nautical miles. The Boeing 747 is an American wide-body commercial jet airliner and cargo aircraft. The first wide-body airplane produced, it was the first plane dubbed a "Jumbo Jet". Its distinctive hump upper deck along the forward part of the aircraft has made it one of the most recognizable aircraft. Manufactured by Boeing's Commercial Airplane unit in the United States, the 747 was originally planned to have 150 percent greater capacity than the Boeing 707, a common large commercial aircraft of the 1960s. First flown commercially in 1970, the 747 held the passenger capacity record for 37 years. Taegeuk is the Korean form of the Chinese term Taiji, meaning "supreme ultimate". 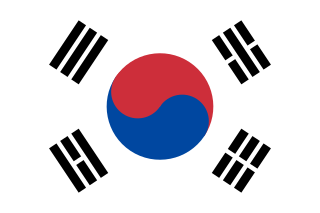 The symbol was chosen for the design of the national flag in the 1880s, known as taegeukgi. The Taegeuk is commonly associated with Korean tradition and represents balance in the universe: the red half represents positive cosmic forces, and the blue half represents the opposing negative cosmic forces. It is used in Korean Shamanism, Confucianism, Daoism and Buddhism. The Fokker F28 Fellowship is a short range jet airliner designed and built by Dutch aircraft manufacturer Fokker. Korean Air Lines Boeing 747SP at EuroAirport Basel Mulhouse Freiburg in 1985. Korean Air takes delivery of its first Airbus A380 at Toulouse–Blagnac Airport, France, May 25, 2011. In 2013, Korean Air acquired a 44% stake in Czech Airlines. It sold the stake in October 2017. Korean Air's headquarters, the Korean Air Operations Center (대한항공 빌딩  ), is located in Gonghang-dong, Gangseo-gu in Seoul. Korean Air also has offices at Gimpo International Airport in Seoul. Korean Air's other hubs are at Jeju International Airport, Jeju and Gimhae International Airport, Busan. The maintenance facilities are located in Gimhae International Airport. Korean Air is also an airline partner of Skywards, the frequent-flyer program for Emirates. Skywards members can earn miles for flying Korean Air and can redeem miles for free flights. Currently being reconsidered after the crash of ET302 and the ban from Korean airspace of the type. Airbus A300-600RF 2 2015 2015 Converted from Airbus A300-600R. 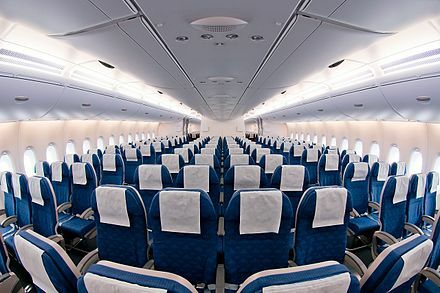 Korean Air offers four types of first class, three types of business (Prestige) class, and two types of economy class. 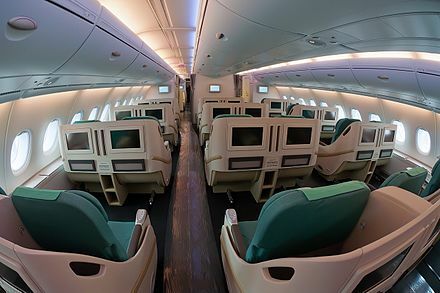 Prestige Class seats include "Prestige Sleeper" seats on all Boeing 777-300ERs and Airbus A380s, as well as 777-200ER aircraft that feature "Kosmo Suites" seats; "Prestige Plus" seats on most of the Boeing 777-200ER fleet, most of the Boeing 747-400 fleet, and one Boeing 777-300; and "old Prestige Class" seats. "Prestige Sleeper" seats recline to 180 degrees, while "Prestige Plus" seats recline up to 172 degrees. "Old Prestige Class" seats recline up to only 138 degrees, although these seats are being phased out except for on Boeing 737 aircraft. Economy Class seats recline up to 121 degrees. A new type of seat called "New Economy Class" is being installed on all Boeing 777-300ER and Boeing 777-200ER aircraft with Kosmo Suites, all Boeing 777-300 aircraft, some Airbus A330-300 aircraft, some Airbus A330-200 aircraft, the Airbus A380 aircraft (factory-installed), and brand new Boeing 747-8i aircraft. The "Kosmo Suites" seats and the "Prestige Sleeper" seats were first introduced in the Boeing 777-300ERs in May 2009. Both seats could stretch to 180 degrees, and became more private than seats before. The Korean Air Airbus A380-800 aircraft also feature an inflight bar called the Celestial Bar in partnership with Absolut Vodka, featuring a range of Absolut cocktails, along with an integrated lounge space. It is located on the upper deck Business Class cabin, and is accessible only to First and Prestige class passengers. A wide-body aircraft, also known as a twin-aisle aircraft, is a jet airliner with a fuselage wide enough to accommodate two passenger aisles with seven or more seats abreast. The typical fuselage diameter is 5 to 6 m. In the typical wide-body economy cabin, passengers are seated seven to ten abreast, allowing a total capacity of 200 to 850 passengers. 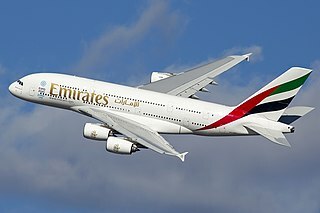 The largest wide-body aircraft are over 6 m (20 ft) wide, and can accommodate up to eleven passengers abreast in high-density configurations. Thai Airways International Public Company Limited, trading as THAI is the flag carrier airline of Thailand. Formed in 1988, the airline has its corporate headquarters in Vibhavadi Rangsit Road, Chatuchak District, Bangkok, and primarily operates from Suvarnabhumi Airport. THAI is a founding member of the Star Alliance. The airline is the second-largest shareholder of the low-cost carrier Nok Air with a 21.80 per cent stake, and it launched a regional carrier under the name Thai Smile in the middle of 2012 using new Airbus A320 aircraft. The Boeing 747-400 is an American wide-body jet airliner developed by Boeing Commercial Airplanes. 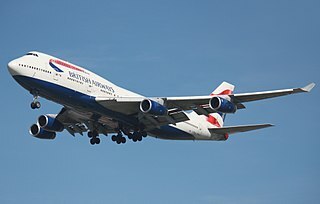 Derived from the earlier versions of the Boeing 747, the 747-400 retains the four-engine wide-body layout of its predecessors, whilst incorporating numerous technological and structural changes to produce a more efficient airframe. Its most distinguishing features versus preceding 747 models are 6-foot (1.8 m) winglets mounted on 6-foot (1.8 m) wing tip extensions, which are found on all 747-400s except for Japanese domestic market versions. It is the best-selling model of the Boeing 747 family of jet airliners. Emirates SkyCargo is a cargo airline based in Dubai, United Arab Emirates. As of 2019, it is the second largest cargo airline worldwide in terms of the total freight tonne-kilometres flown and the largest in terms of international freight tonne-kilometres flown. A four-engined jet, sometimes called a quadjet, is a jet aircraft powered by four engines. The presence of four engines offers increased power and redundancy, allowing such aircraft to be used as airliners, freighters and military aircraft. Many of the first purpose-built jet airliners had four engines, among which stands the De Havilland Comet, the world's first commercial jetliner. In the decades following their introduction, their use has gradually declined due to a variety of factors, including the approval of twin-engine jets to fly further from diversion airports and an increased emphasis on fuel efficiency. ↑ "Airline Insight: Korean Air". blueswandaily.com. November 14, 2018. Retrieved November 14, 2018. ↑ Tatiana Rokou (December 13, 2012). "Seoul voted "Best International Meetings Destination" for 2012". Archived from the original on January 22, 2013. 1 2 "Directory: World Airlines". Flight International . April 3, 2007. p. 102. ↑ "Korean Air Lines Co., Ltd. History Archived May 22, 2012, at the Wayback Machine ". International Directory of Company Histories, Vol. 27. St. James Press, 1999. ↑ "World Airline Directory." Flight International . May 16, 1981. 1444. ↑ Yu, Roger (August 26, 2009). "Korean Air upgrades service, image". USA Today . Retrieved September 16, 2009. ↑ "Korean Air slides to second quarter loss but touts 'record high' revenue". ATW Online. August 16, 2010. Retrieved August 16, 2010. ↑ "Navoi Cargo Terminal opens in Uzbekistan; Korean Air to expand cargo network". ATW Online. August 16, 2010. Retrieved August 16, 2010. ↑ Hovet, Jason; Hepher, Tim (April 10, 2013). "Korean Air finalises investment in loss-making Czech Airlines". Reuters . Retrieved August 4, 2015. ↑ "일반현황 / 기업개요". Korean Air. Retrieved September 9, 2010. "주소: 서울 특별시 강서구 공항동 1370번지 대현항공 빌딩"
↑ "Who We Are - Korean Air". www.koreanair.com. Retrieved June 14, 2016. ↑ "Why Nearly Half of Asiana Passengers Were Chinese." The Wall Street Journal . July 7, 2013. Retrieved on July 19, 2013. ↑ "Korean Air codeshare partners". Korean Air. Retrieved July 4, 2017. ↑ "Profile Korean Air". CAPA. Centre for Aviation. Archived from the original on October 29, 2016. Retrieved October 29, 2016. ↑ "Korean Air / Aurora begins codeshare partnership from July 2018". Routesonline. July 12, 2018. ↑ "Delta and Korean Air to expand partnership". Delta Air Lines. Retrieved March 29, 2017. ↑ Hawaiian Airlines (March 22, 2011). "Hawaiian Airlines, Korean Air Team Up On Frequent Flyer Benefits". Hawaiian Airlines. Retrieved April 25, 2017. ↑ "Korean Air expands LATAM codeshare to Brasil in Nov 2018". Routesonline. November 29, 2018. ↑ "Korean Air signs interline deal with Flybe". Breaking Travel News. 23 March 2019. ↑ "JetBlue and Korean Air Announce New Interline Agreement to Connect Customers Between Asia and North America". PR Newswire. 28 February 2012. ↑ "Korean Air Lines Fleet Details and History". planespotters.net. December 30, 2016. Retrieved December 30, 2016. ↑ "Korean Air fleet and seat maps". Korean Air. Retrieved June 1, 2018. ↑ "Business Jet Services". Korean Air. Retrieved August 18, 2016. 1 2 "Program Status Report - C Series aircraft" (PDF). Bombardier Aerospace. March 31, 2018. Retrieved May 31, 2018. ↑ "Korean Air becomes the third operator of the Bombardier CS300". World Airline News. December 22, 2017. ↑ "Korean Air set for maiden CS300, to begin ops in early 1Q18". ↑ "Korean Air finalises order for 30 A321neo" (Press release). Airbus. November 6, 2015. ↑ "Boeing, Korean Air Announce Airline's Intent to Purchase 30 737 MAXs" (Press release). Boeing. June 16, 2015. ↑ "Korean Air Joins Boeing 787 Family with up to 20-Airplane Order". Boeing. April 11, 2005. ↑ "Boeing Delivers Korean Air's First 787-9 Dreamliner". February 22, 2017. Retrieved February 22, 2017. ↑ Ghim-Lay Yeo. "Korean Air converts 10 787-8s to -9s". Singapore: Flight International . Archived from the original on March 21, 2011. Retrieved December 23, 2016. ↑ "Korean Air business jet fleets". Korean Air. ↑ Greg Waldron (October 18, 2016). "Korean Air expands business jet charter unit". FlightGlobal. ↑ "Korean Air adds maiden Gulfstream G650ER". Ch-Aviation. August 3, 2016. ↑ "Korean Air Lines Fleet Details and History". planespotters.net. June 26, 2018. ↑ "Korean Air Mulling 'Large' Widebody Jet Order for Expansion". Bloomberg. 19 October 2018. ↑ "Korean Air introduces premium seats" (in Korean). ↑ "Absolut Celestial Bar on Korean Air A380 aircraft". Contrast Magazine. Archived from the original on March 24, 2012. Retrieved December 23, 2016. ↑ "Lancome Opening Duty-Free Shops on Korean Air's A380 Airplanes". Racked.com. Retrieved August 8, 2011. ↑ "Korean Air Aerospace Division (KAA)". GlobalSecurity.org. Retrieved April 29, 2013. ↑ Carrier moonlights in aerospace. Los Angeles Times. (February 18, 2007). ↑ Korean Air Aerospace Division Official Website Archived September 29, 2007, at the Wayback Machine . Kal-asd.com. ↑ Choi, Kyong-Ae (October 8, 2012). "South Korea Consortium in Talks With Bombardier About Developing Passenger Plane". Wall Street Journal . Retrieved December 23, 2016. ↑ See Malcolm Gladwell, Outliers (2008), pp. 177–223 for a discussion of this turnaround in airline safety. Gladwell notes (p. 180) that the hull-loss rate for the airline was 4.79 per million departures, a full 17 times greater than United Airlines which at the same time had a loss rate of just 0.27 per million departures. ↑ Stanley, Bruce (2006-01-09). "Korean Air Bucks Tradition To Fix Problems". www.wsj.com. The Wall Street Journal. Retrieved 2019-04-11. ↑ Kirk, Don (March 26, 2002). "New Standards Mean Korean Air Is Coming Off Many 'Shun' Lists". The New York Times . Retrieved September 23, 2009. ↑ Pasick, Adam (December 9, 2014). "Nepotism in a Nutshell". The Atlantic . Retrieved December 23, 2016. ↑ "Ex-Korean Air Executive Arrested Over 'Nut Rage' Incident". NPR.org. December 30, 2014. Retrieved April 24, 2015. Wikimedia Commons has media related to Korean Air .